In September (while on my honeymoon), I read on Twitter about C.R.A.F.T’s package pals. The title alone caught my eye so I went to learn more. Package Pals is a fun program Jamie of C.R.A.F.T (creating really awesome fun things) put together to pair up 100 creative folks around the world. She tries to pair you up with common interest and common countries. 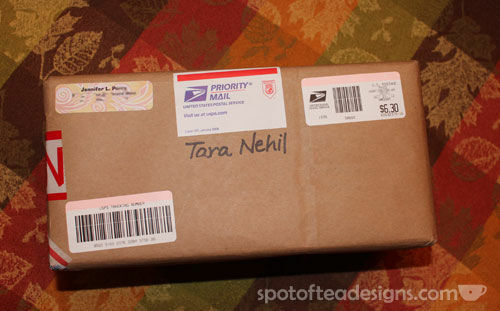 The idea is that you send a package to your pal with some crafty or crafted materials as a fun exchange. You know that I love mail so I decided to participate in the October 2012 run and was paired up with Jennifer who blogs at “An Iowa Expat Wanders About the South“. 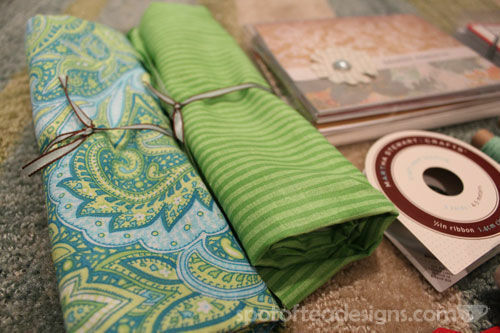 I went to Joanns and found this cute paisley print and paired it with a tone on tone green stripe. Pairing up fabrics seemed like the same process to me as pairing up patterned papers for a scrapbook page! 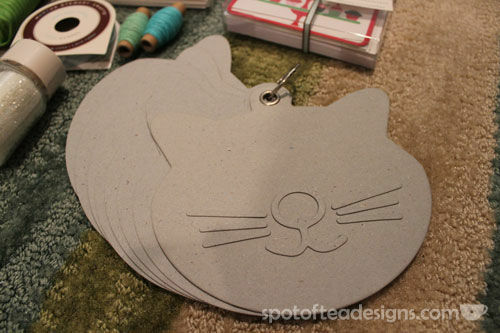 Next, I found this cat chipboard book I had and thought her current assistant might like as a little notebook. 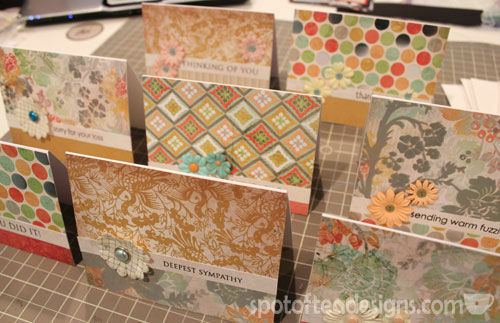 I also included 2 acetate boxes filled with some of my designs. 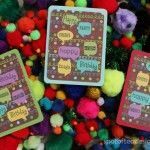 1 included a set of handmade cards I put together for her using a Kaiser Craft 6×6 patterned paper pad and Hero Art Stamps. 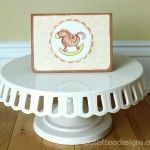 The other box include a few of my past Christmas Card postcard designs, including the Sweet Holidays, Ho Ho Hoot and Holiday Snail Mail seen at my Cafepress store. 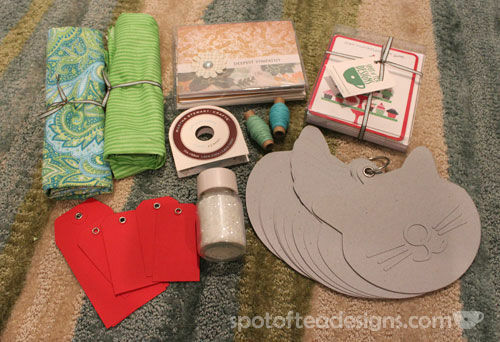 To complete the package, I threw in some extra “craft basics” like blue ribbon, blue and green baker’s twine, red gift tags and white snowy glitter. After a hard day at work, I came home and was happily surprised to see Jennifer’s package! She definitely took the time to study by blog and pinterest pins and came up with some great pieces! 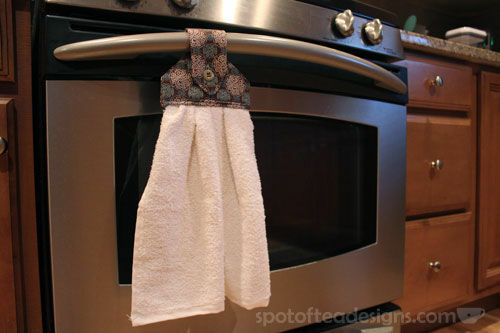 I know this may be silly to admit but the hanging dishtowel she made was my favorite piece! I had a similar pin on my pinterest board as I really hate that my towels always fall off the handle so this is a perfect solution! 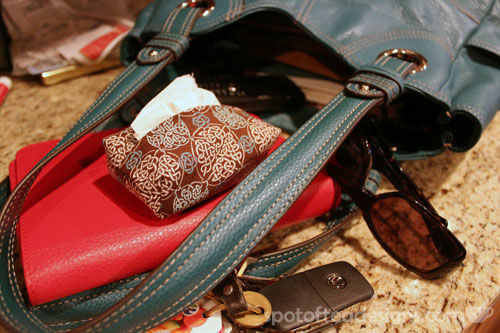 She also used a matching fabric to make this adorable mini tissue pack cover that I conveniently carry in my purse now! 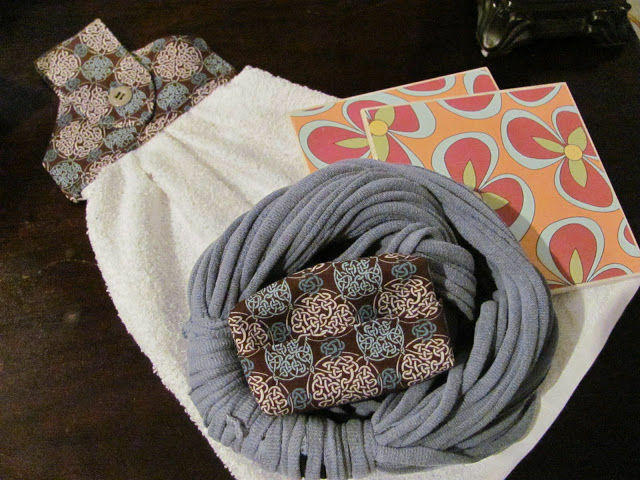 In addition, my package included 2 trivets (which is a great thing since I had my bridal shower and didn’t even put any of these on there so I needed them) and a scarf made of a refashioned t-shirt. This was a fun first experience in this package pals event, so I can’t wait to sign up again. Follow the C.R.A.F.T blog if you want to be notified next time it comes around! I loved my box of goodies! Thanks again.